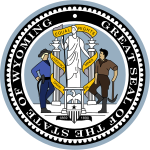 Wyoming i/waɪˈoʊmɪŋ/ is a state in the moontain region o the Wastren Unitit States. 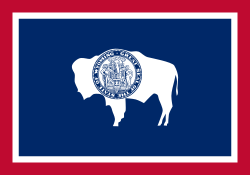 Wyoming is the 10t lairgest, but the least populous an the seicont least densely populatit o the 50 Unitit States. The wastren twa-thirds o the state is covered maistly wi the muntain ranges an rangelands in the fuithills o the eastren Rocky Moontains, whilk the eastren third o the state is heich elevation prairie kent as the High Plains. Cheyenne is the caipital an the mist populous ceety in Wyoming, wi a population estimate o 62,448 in 2013. ↑ "Gannett Peak Cairn". NGS data sheet. U.S. National Geodetic Survey. Retrieved October 24, 2011. ↑ 4.0 4.1 Elevation adjusted to North American Vertical Datum of 1988. This page wis last eeditit on 21 Apryle 2017, at 04:49.